The value of a Suzor-Côté, 1869-1937 - 50 cents 1969 stamp depends on several factors such as quality and wear, supply and demand, rarity, finish and more. Values in the section are based on the market, trends, auctions and recognized books, publications and catalogs. This section also includes information on errors and varieties and characteristics. 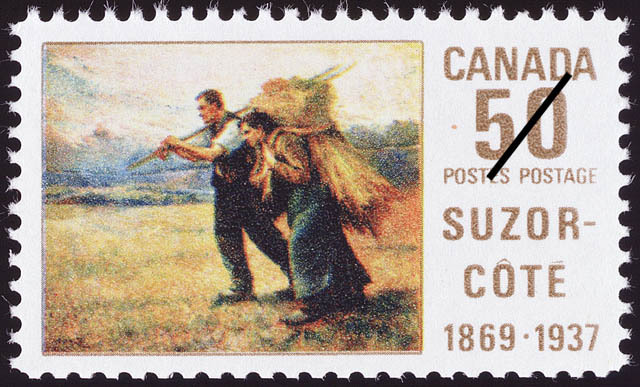 The one hundredth anniversary of the year in which Aurèle de Foy Suzor-Côté, R.C.A., was born is commemorated by a Canada Post Office stamp featuring a multi-colour reproduction of his Return from the Harvest Field. Suzor-Côté, born at Arthabaska, Quebec, on April 6, 1869, reputed to be one of the 1st native-born Canadian artists whose works, presumably as a result of contact with European painters, were directly influenced by the Old World's Impressionism of the 1860's. He has been linked with Monet, Whistler, Pissarro, Manet and others in his light-filled interpretations of Canadian landscapes highlighted by touches of pure colour pigment. Evidence of his versatility and a leaning to impressionism, is to be found in some 40 or 50 beautifully executed small bronze figures and groups. An aptitude for the arts, encouraged by his artist father, became evident early in Suzor-Côté's life. Subsequent to completing his studies at the Collège du Sacré-Coeur, Arthabaska, he became engrossed in masterpieces which he attempted to reproduce with painstaking fidelity. Later intervened to turn this man to a path which would end in an artistic heritage to his nation and an international recognition of his name. His departure for Paris in 1890 had brought with it a decision to pursue a vocal career; endowed with an excellent baritone voice, he put aside plans to enter an art school, choosing instead a Conservatory of Music. Laryngitis and a subsequent operation resulted in damage to a vocal chord thereby terminating the possibility of a brilliant operatic career which had already beckoned. Turning his talents to painting and sculpture, Suzor-Côté studied at l'Ecole des Beaux-Arts and the Julian and Colarossi Academies. His initial exhibition was in 1894 at the Salon des Artistes Franç awards followed with regularity and a few years later his Death of Archimedes won the Grand Prize at the Paris Salon. He travelled extensively in Europe continually absorbing the styles of other painters and the beauty of his surroundings. Eventually the call of his homeland exerted an undeniable influence and in 1908 he returned to Canada; establishing a studio in Montreal he continued his career with classic interpretations of Canadian landscapes. True happiness came to Suzor-Côté when he considered perfection had been achieved; it has been said he would continue to add minute touches to a painting for weeks after others would have considered the work complete. In 1929, illness again intervened and Suzor-Côté moved to Daytona Beach, Florida, where he died on January 29, 1937, Suzor-Côté's canvas chosen for reproduction on our stamp was painted in 1903 while the artist was in Europe; having dimensions of 78½ inches by 67½ inches, it is one of his larger works in the Ottawa National Art Gallery, by whose permission the painting has been used. The Suzor-Côté collection in the national art repository consists of 11 paintings, 4 sculptures and a number of drawings. 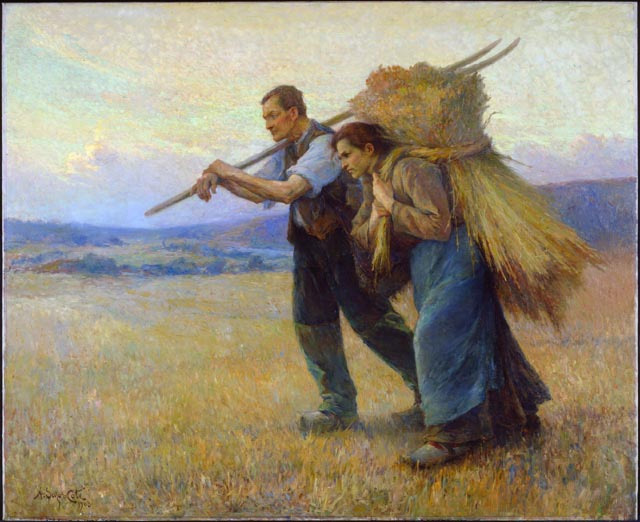 Return from the Harvest Field was acquired by the nation in 1904. Other Suzor-Côté works in Canada are to be found in the Québec Provincial Museum and in private collections.